Holiday Sale & Holiday Pops Concert! SALE SALE SALE: 20-30% off!!! Don't miss out! Sale ends December 20. All of Billy's cds/dvds/tee's are 20% off. For bulk purchases of five items or more you'll receive 30% off but you must contact us by email (office@billyjonas.com) or phone (828-232-9962). This year the Asheville Symphony Orchestra invited Billy Jonas to be the guest artist for their annual Holiday Pops Concert at Thomas Wolfe Auditorium in Asheville. Come enjoy the glowing textures of the orchestra supporting Billy's trademark audience-participatory style, with a dash of holiday cheer thrown in! See sidebar for more details. Calling all schools, families, friends, and relatives! Come join in the holiday fun with a "Multicultural Holiday Concert & Celebration!" 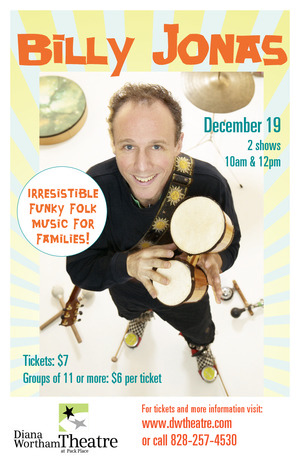 This is sure to be an upbeat, whimsical, heartwarming family show at the Diana Wortham Theatre on Monday Dec. 19th for two shows, 10 am and noon. School groups are welcome, as well as families and the general public. RESERVATIONS ARE ENCOURAGED - tix are selling fast! See sidebar for details. Billy Jonas Band at the White House! 911 Video "Someone Like You"
March 2011 News THE NEW STUDIO SPACE!!! BILLY ON PUBLIC TV IN YOUR CITY!